Representation and the Media is an introductory lecture that unpacks one of the central ideas of cultural studies-that reality is not experienced directly, but always through the lens of culture, through the way that human beings represent and tell stories about the world in which they live. 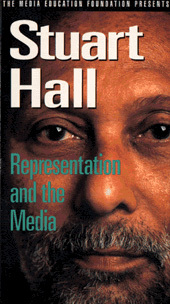 Using concrete examples, Hall shows how the media-and especially the visual media-have become key player in the process of modern storytelling. SECTIONS: Visual Representation & the Contemporary World / An Old View: Representation as reflection/distortion of reality / A New View: Representation as constitutive / Culture as Primary / Conceptual Maps: Classifying the world / Language & Communication / Reality & Discourse / The Practices of Signification / Meaning & Absence / Identity, Identification & the Viewer / Meaning is Interpretation / Ideology and Power Fix Meaning / Contesting Stereotypes: Positive representations / Contesting Stereotypes: Taking images apart / What is at Stake in Representation?